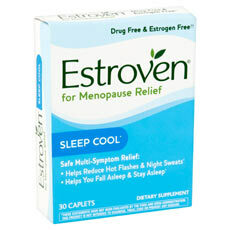 Estroven Sleep Cool is a natural supplement which is supporting ladies and women to have better life during menopause stages of life. Most of the menopause symptoms are not desirable and every woman is trying as much as possible to have better health in the body even after the stages of menopause. With the emergence of menopause characteristics, estrogen hormone decline and strange conditions emanate from the body such as hot flashes and sweats during the night. The female users of this natural supplement Estroven Sleep Cool will gain better state of body even during the dreaded post menopause life. Those who made the supplement have studied a lot in the best natural ways of supporting balance in estrogen hormone in order to boost health of the women during menopause. There is an elaborate platform online from where users are free to make their orders of the supplement and wait for delivery to be done. The users will provide some information including name, e-mail address, locational physical address and zip code in order to get the supplement Estroven Sleep Cool delivered to the faster and safer. With all these details provided and the account details provided, the users will be able to receive the formula in less than one week. The supplement is made by a company which is known as Estroven and is known to make the users have better sleep moment and even fall asleep quite faster than normal. It is claimed by the manufacturer to make the users wake up feeling better refreshed and manage to perform most of the duties of the day while very active and energized. There is also a claim about the supplement that there is no habit forming in usage of the formula since it is not addictive in nature but only supports better health in the body of the users naturally and safely. According to the manufacturer, this is one of the most affordable supplements in the market which are effective in supporting women at menopause stage of life. Soy Isoflavones – The ingredient is important in the supplement to maintain better health in the body while using the supplement to gain improved general menopause elimination. Black Cohosh Root – The ingredient is having a long history in being one of the most reliable natural solutions to boost estrogen hormone levels in the body and avoid hot flashes which normally come with menopause. The ingredient is thus supportive in eradicating such attributes from the body without interfering with the general health of the user. Melatonin – This is another ingredient in the supplement which is known to make the body of the users attain better health with improved support to minimize poor sleep as well as refreshment in the morning. The formula is made up of natural contents; this is implying that the users will not have any damaging effect in the body at all. It is safe and helps in ensuring better health attainment in the whole body during menopause. Magnesium stearate in the formula is good at enhancing the health of the users of the supplement and providing better calming of the brain and deep sleep. Most of the users of the supplement have praised it for its impressive benefits in the body with no demerits ever noted. It is easier to use in the body to support better health. There are no cons in the usage of Estroven Sleep Cool on the body. How long should one use the supplement? The user of the supplement should strive to use the supplement regularly for the first 60 days in order to ensure improved health. Menopause stage of life normally comes with its own challenges in the body of ladies. Most of the symptoms of this stage of life are likely to be undesirable and people will try as much as possible to remove them from the body. Estroven Sleep Cool is a formula which is already in the market in order to support women in gaining improved health of the body even at menopause by ensuring that there is estrogen hormone secretion in the body.